Missed appointments or no-shows are defined as "patients who neither kept nor canceled their scheduled appointments". Studies conducted previously in primary care settings found that the rates of missed appointments in the United States vary from 5% to 55%. We conducted a pilot study amongst the healthcare providers at Griffin Faculty Physicians (GFP) and Griffin Hospital Wellness Clinic (GHWC). We conducted a telephone survey in which the patients who missed scheduled appointments from July-September 2016 at GFP and January-September 2016 for GHWC were contacted by telephone from August-October 2016 following a standard script. We examined the free text data from the telephone survey relating to reasons for missed appointments and discussed and categorized the main themes. We used SAS 9.4 for the data analysis. Out of a total of 675 patients who missed their appointments, 218 (32.3%) attended the telephone calls. Out of these 218 patients, 82 (37.6%) reported that they forgot about their appointment or did not know that they had an appointment. 35 (16.1%) of the patients reported personal issues as the reason for missing their appointments. 15 (6.9%) of the patients reported a lack of transportation as the reason for not completing their appointment. This study emphasized the need for more research for a better understanding of the problem. We made recommendations for prompting patients about their upcoming appointments, helping patients get transportation to healthcare facilities and making efforts to ensure better communication between the patients and the healthcare providers to understand the complex interplay between personal, systemic and financial barriers in completing appointments. Missed appointments or no-shows are defined as "patients who neither kept nor canceled scheduled appointments ". Missed appointments cost the United States healthcare system more than $150 billion a year. It causes disruption in the continuity of the provision of healthcare services, adds to the dissatisfaction of patients due to delays in getting new appointments and hinders the detection and treatment of diseases [2-6]. The rates of missed appointments vary between countries and healthcare systems. Studies conducted previously in primary care settings found that the rates of missed appointments were (5%-55%, in different series) in the United States , (29.5%) in Saudi Arabia , (36%) in Israel , and (6.5%-7.7%) in the United Kingdom. Only a few studies have been conducted in Latin American populations. Many studies have been conducted to understand the reasons for missed appointments and to devise interventions to counter it. Keeping in mind the magnitude of the problem and its persistence over time, a dire need is felt for more work on the same subject. One study suggested that missed appointment is likely to be influenced by three kinds of barriers i.e. personal, structural/organizational, and financial . Personal barriers may include attitudes towards healthcare, education and various demographic characteristics. Barron WM, et al. found that patient most likely to fail to keep a given appointment is one who is young, comes from a low socioeconomic group, has a large and unstable family, and has a previous history of no-shows . Anderson, et al. showed that living in a deprived area was associated with a threefold increase in the likelihood of missing an appointment, and the extent of this association was the same across four different clinical settings . A 'Deprived Area' is a frequently used concept but has no singular definition. Anderson, et al. claim that area deprivation "may summarize an area's potential for health risk from ecological concentration of poverty, unemployment, economic disinvestment, and social disorganization [13,14]". Structural or organizational problems such as lack of transportation to healthcare facilities, difficulties in appointment systems, working hours of clinics, lack of awareness of available resources for transport and the interaction of healthcare staff with patients are likely to affect missed appointments . Pesata, Pallija, and Webb  found transportation problems, wait times, and not knowing the reason for the appointment as reasons for missed appointments . A small-scale study on a series of forty patients in a general practice was conducted to look at patients' patterns of attendance over the previous five years, together with their reasons for missing scheduled appointments. The main reasons patients gave for missed appointments were: feeling too ill to attend (eight patients), resolution of symptoms (six) or forgotten/confused appointment time (seven) . One interesting reason for missed appointments was the higher consultation rate. Patients with a large number of consultations were noted to have had more than average no-show rates and were also more likely to miss appointments in the future [16,17]. The previous studies discussed several effective methods to reduce the appointment-breaking behavior. Mailed appointment reminders were seen to be both effective and cost-efficient. Many studies suggested that sending a simple letter to such patients reduced the no-show rates . Improved communications between patient and physician combined with personal interest and attention can also produce a positive effect on the appointment-keeping behavior of a patient. Finally, predictive overbooking based on individual patient characteristics and use of the modified wave scheduling technique can increase appointment adherence [7,11]. Due to the significant disparities in previous studies, we conducted a pilot study to get baseline no-show rates among our patients. In fifteen GFP offices, the rate of missed appointments in July 2016 was found to be 36% of the total scheduled appointments (1480/4088), which meant that almost 100 appointments were missed in one month for each physician. In comparison to previous studies where the maximum rate of missed appointments was 30%, our one-month data showed a rate of missed appointments 6% higher than in the previous study. In GHWC, the rate of missed appointments from January 2016 through June 2016 was found to be 33% of the total scheduled appointments (57/175), which meant that almost ten appointments per month were missed. The estimated time lost per physician was approximately 25 hours per month. These results suggest that a larger scale study should be done to analyze the reasons for these high rates of patient no-shows and to consider what interventions could be implemented to reduce these. The above-mentioned results inspired this study to analyze the reasons for the high rates of missed appointments in our GFP and GHWC and to devise interventions to counter them. Griffin Faculty Physicians (GFP) is a multi-specialty medical group affiliated with Griffin Hospital. They serve the residents of the Lower Naugatuck Valley, which consists of the municipalities of Seymour, Derby, Ansonia, Shelton, and Naugatuck. The seven-primary care GFP offices conduct over 36,000 patient encounters per year, with encounters including primary care visits, follow-up visits, and medication administration visits. Eighty-five percent (85%) GFP patients are Caucasian, 3.6% are African-American, 3.5% are Hispanic, and 2% are Asian. About 2% of these patients are self-paid, 51% have Medicare or Medicaid, and the rest have private insurance. The Griffin Hospital Wellness Clinic (GHWC) is a high-tech lifestyle change program that provides tools and support to help prevent and treat many chronic diseases. Ninety-one percent (91%) of GHWC patients are Caucasian, 7% are Hispanic, and 2% are African-American. Griffin Hospital Institutional Review Board has reviewed and granted approval for the study. All the patients 18 years of age and older who either canceled or completed their scheduled appointments from July-September 2016 at all of the GFP primary care offices and from January-September 2016 at the GHWC were contacted by telephone from August-October 2016. We excluded all the patients less than 18 years of age and the patients who were not able to communicate in English. In light of the previous studies on the same subject, we used a standard script to communicate with all the patients. Subjects were not compensated for taking part in this study. •	Unable to pay copay/deductible, did not have insurance, couldn't afford to pay, etc. •	A personal/unrelated issue, family function, works related issue, etc. A total of 675 patients were found to have missed their appointments for GFP and GHWC. We obtained the baseline characteristics of the study population (See Table 1). We contacted a total of 675 patients via telephone and recorded their responses as free text into a spreadsheet. We examined and discussed the free text data from the telephone survey relating to the reasons for missed appointments. We grouped those reasons into the final categories as listed above. We collected the call data of all the patients who answered the telephone survey. We determined and represented the percentage of reasons falling under each category in tabular and graphical forms. We used SAS 9.4 statistical software for the data analysis. 218/675 (32.3%) of patients who missed their appointments attended the telephone calls. (Table 2 and Figure 1) show the reasons provided by the patients. Out of these 218 patients, 82 (37.6%) patients reported that they forgot about their appointment or did not know that they had an appointment. 35 (16.1%) of the subjects reported personal or work-related issues as the reason for missing their appointments. 15 (6.9%) of the patients reported a lack of transportation as the reason for not completing their appointment. 12 (5.5%) patients reported too sick to attend the appointment. Another 11 (5.0%) patients had problems with their health insurance. 9 (4.1%) of the subjects were not satisfied or had negative emotions regarding the PCP or the Practice. 8 (3.7%) patients used another source of care or returned to the ER or the hospital. 6 (2.8%) of the 218 patients thought that the appointment was not essential. We found that forgetting about the appointment or patients not being sure that they had an appointment was the most common reason for missing an appointment. Forgetting an appointment can be the outcome of many factors such as understanding the importance of the appointment, how the appointment reminder system works, and social and psychological conditions of the patients. Although it can be difficult for busy and short-staffed practices to manage reminding patients about their scheduled appointments, very simple and effective steps can be taken to achieve this goal. Reminding patients about their upcoming appointments by adopting Reminder and/or Recall (R/R) systems has been found effective in helping patients complete their appointments . In a previous study set in an urban primary care clinic, calling patients and sending short messages and postal reminders were found to be efficient and cost-effective . The second most common reason reported for missing an appointment was personal or work-related issues. It is difficult to quantify complex factors like personal issues, but better communication between the patient and healthcare providers is the key to understanding personal issues and coming up with solutions for such problems and thus enabling patients to complete their appointments. 6.9% (15/218) of patients in our study reported the lack of transportation as the reason for missing their scheduled appointments. In a previous study, it was found that patients from low socioeconomic background faced more transport barriers to health care access and 10-51% of patients reported that transportation was a barrier to health care access . In the state of Connecticut, the department of social services Medicaid program provides Non-Emergency Medical Transportation (NEMT) for eligible patients. Rides on NEMT can be requested 2-5 business days before it is needed to allow for delivery of tickets/passes/tokens, hence making it easier for the patients to complete their scheduled appointments. There is a need to spread awareness in patients about information on how to avail these services. The main strength of this study is the selection of an understudied problem. The results of this study were in line with previous studies conducted in similar patient population hence increasing the validity of this study [18-20]. Patients who miss appointments tend to report forgetfulness, personal issues, and lack of transport as the main reasons for missing their appointments. This study emphasizes the need for more work to engage patients who miss their appointments and to make efforts to understand the complex interplay of the personal, systemic and financial barriers. Patients should be prompted via text messages, phone calls and mailed appointments to remind them of their upcoming appointments. Efforts should be made to encourage better communication between healthcare providers and the patients. The appointment system should be made more flexible and easily understandable for the patients. Information about available sources of transportation should be made easily accessible for the patients. Provisions should be made to arrange special transport systems for eligible patients. The main limitation of this study is the small size of the study population and the high rate of non-responders. A non-response bias may exist which requires further study on the characteristics of the population under study. There may also be some element of recall bias when respondents were asked about the details of their missed appointments in the past. Out of the 675 patients who missed their appointments only 218 responded making the sample size relatively small. SU looked after overall project execution, management, and manuscript writing. ED and RJ conceived the study design, helped in the manuscript writing. CG and AG collected data, helped in statistical analysis and manuscript writing. TL helped in the development of the phone survey tool. SR and SA interviewed the patients and helped in the manuscript writing. All authors read and approved the final manuscript. The authors of this manuscript declare no conflict of interest. This research received no specific funding from any public, commercial, or non-profit agency or organization. The Health Resources and Services Administration (HRSA) Grant information is as under:T0BHP28572 - Primary Care Training and Enhancement. Tuso PJ, Murtishaw K, Tadros W (1999) The easy access program: A way to reduce patient no-show rate,decrease add-ons to primary care schedules, and improve patient satisfaction. Perm J 3: 68-71. Nguyen DL, DeJesus RS, Wieland ML (2011) Missed appointments in resident continuity clinic: Patient characteristics and health care outcomes. J Grad Med Educ 3: 350-355. Johnson BJ, Mold JW, Pontius JM (2007) Reduction and management of no-shows by family medicine residency practice exemplars. Ann Fam Med 5: 534-539. Bowser DM, Utz S, Glick D, Harmon RA (2010) Systematic review of the relationship of diabetes mellitus,depression, and missed appointments in a low-income uninsured population. Arch Psychiatr Nurs 4: 317-329. Nuti LA, Lawley M, Turkcan A, Tian Z, Zhang L, et al. (2012) No-shows to primary care appointments: Subsequent acute care utilization among diabetic patients. BMC Health Serv Res 12: 304. Schectman JM, Schorling JB, Voss JD (2008) Appointment adherence and disparities in outcomes among patients with diabetes. J Gen Intern Med 23: 1685-1687. Goldman L, Freidin R, Cook EF, Eigner J, Grich P (1982) A multivariate approach to the prediction of no-show behavior in a primary care center. Arch Intern Med 142: 563-567.
al-Shammari SA (1992) Failures to keep primary care appointments in Saudi Arabia. Fam Pract Res J 12: 171-176. Hermoni D, Mankuta D, Reis S (1990) Failure to keep appointments at a community health centre. Analysis of causes. Scand J Prim Health Care 8: 107-111. Detman LA, Gorzka PA (1999) A study of missed appointments in a Florida public health department. Barron WM (1980) Failed appointments. Who misses them, why they are missed, and what can be done. Prim Care 7: 563-574. Neal RD, Lawlor DA, Allgar V, Colledge M, Ali S, et al. (2001) Missed appointments in general practice: retrospective data analysis from four practices. Br J Gen Pract 51: 830-832. Pickett KE, Pearl M (2001) Multilevel analyses of neighbourhood socioeconomic context and health outcomes: a critical review. J Epidemiol Community Health 55: 111-122. Anderson RT, Sorlie P, Backlund E, Johnson N, Kaplan GA (1997) Mortality effects of community socioeconomic status. Epidemiology 8: 42-47. Pesata V, Pallija G, Webb AA (1999) A descriptive study of missed appointments: families' perceptions of barriers to care. 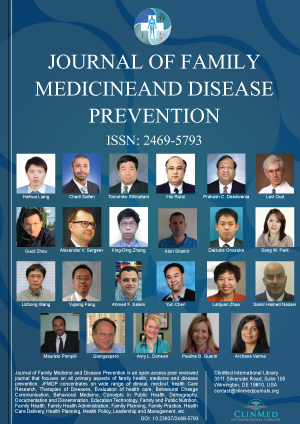 Journal of Pediatric Health Care 13: 178-182. Cosgrove MP (1990) Defaulters in general practice: reasons for default and patterns of attendance. Br J Gen Pract 40: 50-52. Wilkinson MJ (1994) Effecting change in frequent non-attenders. Br J Gen Pract 44: 233. Centers for Disease Control and Prevention (CDC) (1998) Recommendations of the Advisory Committee on Immunization Practices, the American Academy of Pediatrics, and the American Academy of Family Physicians: Use of Reminder and Recall by Vaccination Providers to Increase Vaccination Rates (1998) MMWR Morb Mortal Wkly Rep 47: 715-717. Perron NJ, Dao MD, Kossovsky MP, Miserez V, Chuard C, et al. (2010) Reduction of missed appointments at an urban primary care clinic: a randomised controlled study. BMC Family Practice 11: 79. Syed ST, Gerber BS, Sharp LK (2013) Traveling Towards Disease: Transportation Barriers to Health Care Access. J Community Health 38: 976-993. Saif Ullah, MBBS, MBA, Department of Medical Education, Griffin Hospital, 130 Division St., Derby, CT 06418, USA. © 2018 Ullah S, et al. This is an open-access article distributed under the terms of the Creative Commons Attribution License, which permits unrestricted use, distribution, and reproduction in any medium, provided the original author and source are credited.